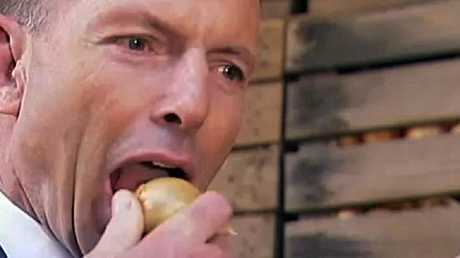 That moment we will never forget, back in 2015, when Tony Abbott decided to bite into a whole, raw onion. IT WAS one of the most bizarre incidents during his prime ministership that had Australia - and the world - collectively scratching its head. 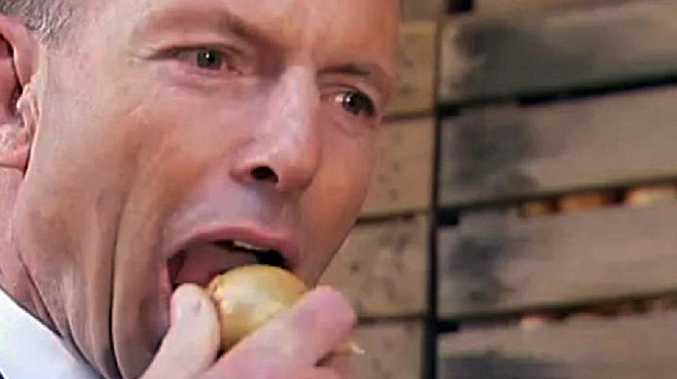 Now Tony Abbott has opened up about the time, unprompted, he took an almighty bite out of a raw onion. Mr Abbott told columnist Andrew Bolt on Sky News on Thursday that many of us eat raw onions all the time and the bulb was "beautiful" to chow down on. His voraciousness when it came to the vegetable was merely to show "appreciation" to a hard working Tasmanian farmer. Mr Abbott told Bolt the onion was peeled and ready to eat. Yet footage from the time clearly shows said onion's skin was still firmly attached. As such, he would have got a mouthful of the papery wrapper as well as the pungent flesh within. 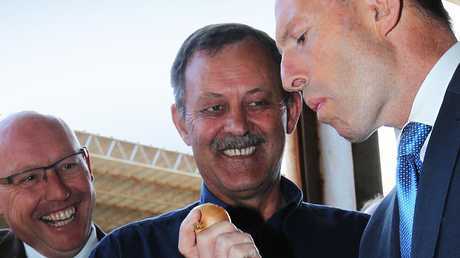 Tony Abbott with Charlton Farm Produce director David Addison seconds before he made the onion in his hand Australia’s most famous vegetable. It was in March 2015 that Mr Abbott was touring Tasmania and found himself at Charlton Farm Produce in the north of the state. The visit was to become a defining moment of his leadership. Upon being presented with an onion, and much to the amusement of the then Attorney-General George Brandis beside him, Mr Abbott went full throttle and took a hearty bite. "That wasn't a dare, prime minister," said the farm owner, as Mr Abbott smiled the forced smile of a TV presenter who has to taste-test some truly awful on-air cooking and look like they really, really enjoy it. But the member for Warringah, on Sydney's northern beaches, insisted to Bolt it was not just a lovely snack but it was essentially his patriotic duty to eat it. "I was at a Tasmanian farm and the farmer, understandably, was incredibly proud of his produce," he said. "All of us eat raw onion occasionally. Salads are full of raw onion," he insisted, sidestepping the fact raw onions are usually thinly sliced, not just dumped whole onto some lettuce. "This was an onion that had lost all of its outer skin, it had been peeled, and I thought the least I can do with someone who was as proud of his product as he was, was to take a chomp and it was beautiful." The footage shows the onion was not peeled. But, moving on, he said eating it was the true blue thing to do. "The job of the prime minister who is, if you like a country cheerleader in chief not just CEO of Australia Inc., is to do what you can to show your appreciation for your fellow Australians." At the time, a representative of Onions Australia, the industry's peak body, told ABC the incident, "certainly brought a tear to my eye. 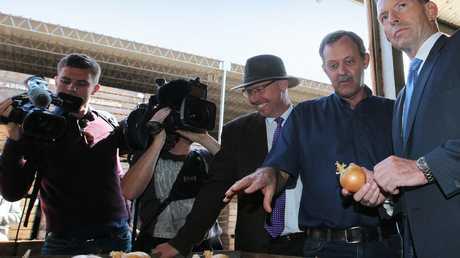 But that was a tear of joy, what a wonderful endorsement of the Australian onion industry". But even she admitted it was "not common" to chow down on a whole raw onion and certainly not with the skin on. "Personally, I would peel it first." 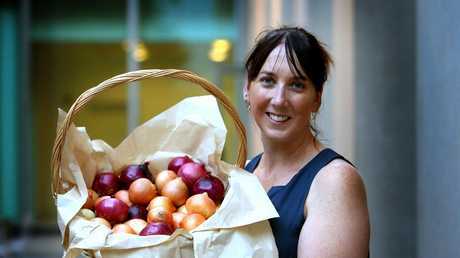 Lechelle Earl, the 2015 CEO of Onions Australia, went to Parliament House and delivered this delicious raw onion snack pack to Tony Abbott. He must have been thrilled. She advised others that might like to emulate Mr Abbott's onion eating to choose a Queensland grown variety which are milder than their Tasmanian counterparts. According to Onions Australia, onions are Australia's fourth largest vegetable crop accounting for 9 per cent of total vegetable production. Each Australian consumes about 7.8kg of onions each year. 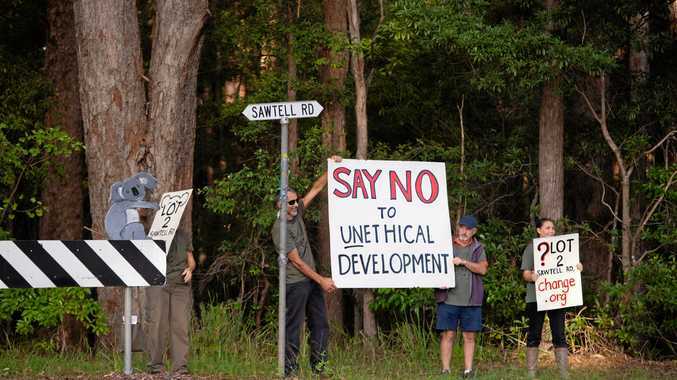 Mr Abbott has been hitting the airwaves and TV screens over the past few weeks as he faces a battle to hang onto his seat at the upcoming federal election. He is being challenged by one of Australia's most famous skiers, Zali Steggall, as an independent candidate. Other independents have been slowly withdrawing from the race setting up an effective head-to-head between Mr Abbott and Ms Steggall. The onion’s going in, there’s no stopping it now.